I’m participating in a quick, five-day workshop on OER from Dec. 5-10 called Ed Tech Open, and one of the things for the first day (which I’m now two days behind on!) was to look over some resources on creative commons and create something about CC licenses that is itself CC licensed. I thought about making an image, a poster, something like that, but I just don’t have time in this lightning-speed workshop! So I decided to take a look at a few charts/infographics/posters and make a few comments about those. 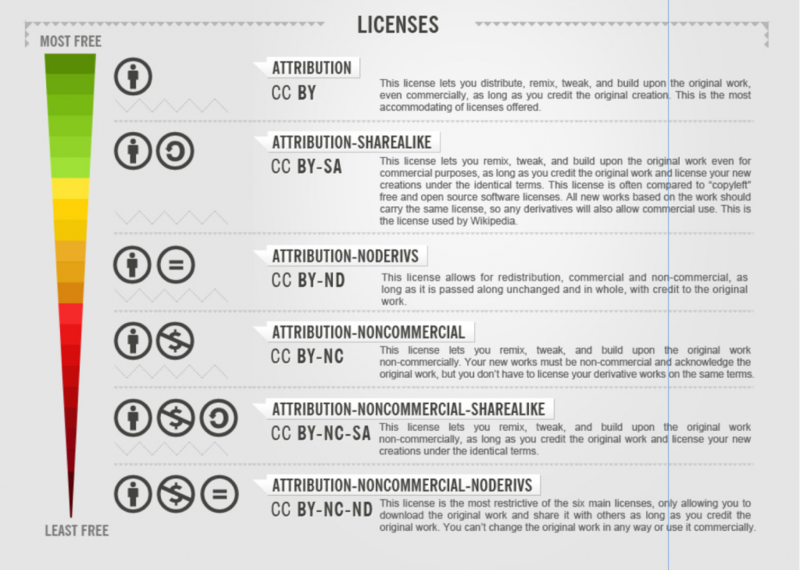 I was wondering what some of the effective ways might be to explain CC licenses visually. I found the first one, below, from the OER workshop itself, and the others through various web searches. I’ll just saw a few things about how effective I think each one is. BUT, I recognize that such things are quite subjective; what makes sense, seems easy and clear, is going to differ amongst persons I expect. The following chart, from CC Australia, gives a kind of decision tree for determining which license to use. Here’s the link to the source. This chart is licensed CC BY 2.5 Australia. The questions on this poster are very helpful, I think–they’re simple and clear. The colours are what confuse me. The explanation on the left says that the pink boxes refer to remixing, the blue ones refer to commercial uses, and the purple boxes are the licenses. That makes sense, but then if you go that route then the first couple of boxes (the green “start” and the red “all rights reserved” boxes have to be different colours, of course. And the effect of all that just feels a bit confusing to me. I do like the use of red for the “all rights reserved” box, though. It visually indicates that others can’t do things with your work w/o your permission, and it also subtly suggests that maybe one shouldn’t just jump to go that route–red can indicate, to me, a kind of warning, a danger. One thing I’d like to see in flowcharts like this is some indication of the implications of one’s choices that one might not be aware of. Sure, I may think I don’t want anyone to change and adapt my content, but would I still think so if I knew that meant that people couldn’t even translate it into a different language, that I thereby make it such that my content will be unlikely to be used in many educational contexts, where adaptation to particular circumstances and learning needs is common? The following poster (link to the original source) comes from Creative Commons Poland, and was designed by Piotrek Chuchla. I think the strength of this poster lies in the fact that it emphasizes images over text. The text is there, of course, but it’s deemphasized. This might work for those who really gravitate towards images. But for me, it’s really no less confusing because I have to make sense of the images themselves. It’s like it’s adding a new visual “code” that I’m unfamiliar with, and that I have learn to recognize (with the text) before I can decipher the meaning. For me, this is a bit off-putting and makes things more complicated. I feel like I’m being hit with a wall of images on each row that I have to spend a great deal of time figuring out. But as they don’t clear give a CC license for this chart, and the copyright notice at the bottom of their site says “All Rights Reserved,” I don’t think I can re-post it here. I find the format of this one easier to read and clearer, myself. The colour-coded checks under various columns let me know at a glance which licenses allow for commercial use, revision, etc., and which don’t. I also like the brief explanation of each column that follows the chart. The original creator retains copyright in their works when using any CC license. One doesn’t give up copyright. Everything depends on what permissions the original creator allows for use of the work when asked. The things that are “x” under each column may actually be allowed by the author/creator. It’s just that you have to ask permission first. So I find the “copyright” row problematic. 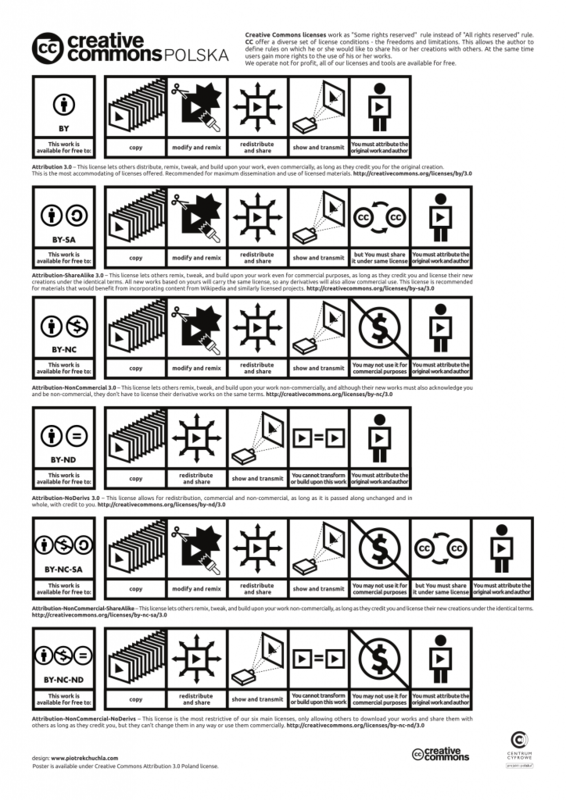 But I’m glad they included the “public domain” row, which many charts leave out. It’s just that they suggest that it’s only for those works whose copyright has expired or forfeited. It doesn’t let people know that they can choose to use CC0, the Creative Commons Public Domain Mark. 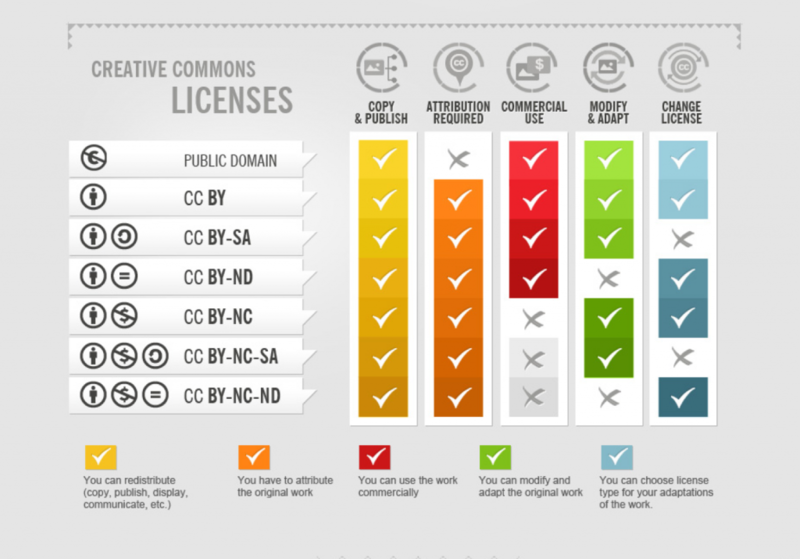 Finally, there is a comprehensive infographic on CC licenses by foter.com, here. It’s quite long and detailed, so I’ll just include a couple of screen shots here. This image is quite similar to that linked to from Xplore, above. It is of course fine if they based their graphic on the one from Foter (which was published earlier), except that since the one from Foter is licensed CC-BY-SA, then the one from Xplore should be licensed similarly (and the original should be attributed). Be that as it may, this original from Foter doesn’t have the confusing bit about copyright, and doesn’t suggest that public domain is restricted to works whose copyright has expired, been forfeited, or is otherwise inapplicable. This suggests that there is a range from most to least permissive, with each license occupying a clear place in that step-wise range. I like the idea here of including the permissiveness/restrictiveness of the licenses in the graphic, but I think the particular order is not exactly clear. Why is ND more permissive than NC? I suppose it is, if one is emphasizing where/how the work may be used, but for OER at least, I think ND is more problematic than NC because to actually be useful in educational contexts one must be able to revise the work. And of course, why not include CC0 in this list, which would be above CC-BY? I find that CC0 often gets left behind in discussions of CC licenses, with people thinking that the most permissive thing they can do is use CC-BY. But if one doesn’t particularly care about being attributed, then why not use CC0? Some may indeed care, and so then of course CC-BY is the right one to use. I don’t have any big conclusions to draw from all this, except that I personally find the one from Foter the best in terms of presenting the information accurately, clearly and simply. I’d be curious to hear if others have different reactions! Posted in Open Access, open ed, OER and tagged creative commons on December 7, 2014 by Christina Hendricks. Why do I care if I’m attributed? 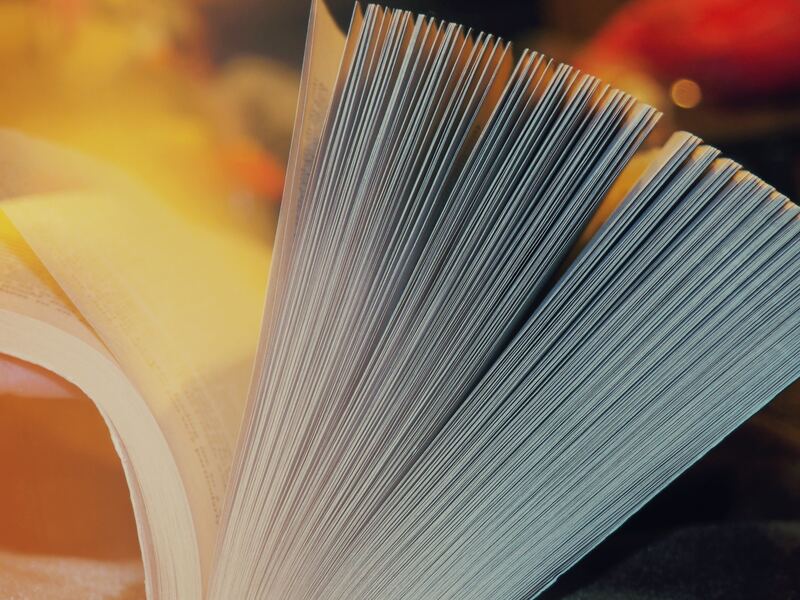 We were talking about sharing our educational or other work, why some people find this difficult, the difference between “open access” and things being open in a wider sense, and more. During the chat Pat’s Tweet kind of just went past me, but as I went back to the #etmchat Tweets for that day to add some to my Storify board on my ETMOOC experience, I came across it again and became curious as to what he meant. Thus started a fairly long conversation about copyright, licenses, public domain, and more. You can see it all here. @patlockley Definitely better understood. Now wondering why ppl might want to be attributed. Why do I have CC-BY on my blog? Why do I care? @patlockley So then no need for attribution or anything. Easy, but why might it be better than CC-BY, e.g.? I mean, philosophically. @clhendricksbc yes, why make it open – to be reused or to be attributed for reuse. Public domain is more understood as a term? Why not make one’s work public domain instead of using something like CC-BY? In the current legal climate, apparently it’s rather complicated: some places, like Canada and the U.S. (and probably other places too–I haven’t done enough research to list them), grant copyright simply through creating a work, and this may not actually be easy (or possible?) to give up (see, e.g., re: the U.S., Wikipedia on granting work into the public domain, and this post from the Public Domain Sherpa, and the last section of this page from Copyfree). One can, though, try to state as clearly as possible that one gives up all copyright and related rights to whatever extent allowed by law, and if not allowed, to give a license to anyone to use the work however they wish, without requirement of attribution. 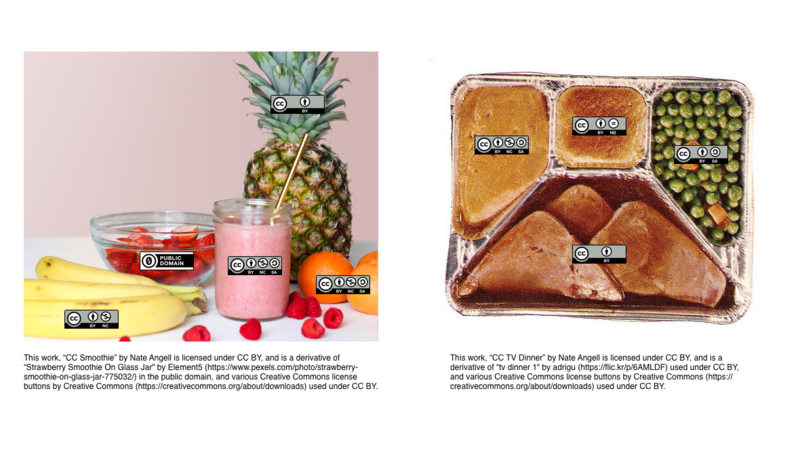 That’s what Creative Commons CC0 is meant to do. Copyfree has a list of various licenses that conform to their standard of “free use,” “free distribution,” free modification and derivation,” “free combination” and “universal application,” and CC0 is one of them (as is the Nietzsche public license, which is rather a personal favourite). So, getting back to the original question and modifying it a bit: why not just use CC0 or something similar, thus releasing one’s work for any use by anyone, without attribution? Why care about attribution? As Pat Lockley noted, it would be good to know that others find my work useful and that they reuse, repurpose and/or rework it. This would be helpful, if for no other reason than to validate for yourself what you’re doing. It could help you do more of it, perhaps. Knowing this would probably also be a way to improve one’s work through finding out what others have done with it. Not to mention it could be a way to potentially connect with others, which might even lead to collaborations. In my own situation, on a pragmatic level, if I could discover and document how others have used my work, this could provide evidence that what I am doing has influence in the wider educational community, which might be one of several ways to support a claim of “educational leadership” or “distinction in the field of teaching and learning” for the new Professor of Teaching rank at UBC. So yes, there are plenty of good reasons to be able to know what others are doing with your work. But all of this requires what is NOT happening with CC-BY (and possibly not with other licenses…I haven’t done enough research to specify): notifying the attributed person that their work is being reused. If another blog links to your blog, you may get a pingback (maybe not; depends on the settings of your blog and the other blog, I think). And it’s a good practice to let other people know when you’ve used their work, if there’s an easy way to do it (such as leaving a comment on a photo posted on Flickr). I try to do that, but too often I forget (I’m working on this). As noted towards the end of the Storified conversation with Pat, what’s missing, in order to get the benefits noted above, is some systematic way to notify people as to how you’ve used their work. I don’t even know how such a thing could work–the technological hurdles seem huge–but theoretically, it seems a good idea. Now, like any such things, one wouldn’t have to choose such a license (an attribution + notification license? ), but for some it would provide a useful way to not just be attributed, but to know what uses their work is being put to. Perhaps it is too difficult/too much of a hassle to bother with. But it’s an intriguing idea. Of course, there are good arguments for making work as free as possible, without restrictions on what you have to do once you’ve accessed it–like attributing the author/creator, or telling him/her what you’re doing with it. So I’m undecided whether I, personally, would want to require more of the people using my work than just attribution. I might not even recommend this to others. But some might want to do it, and it could be useful. But until and unless something like this happens, I’m back to my original question: Why do I care about attribution? If, for the most part, I won’t get the above benefits, what am I getting out of knowing that perhaps, somewhere out there, is a piece of work with my name attached? One might think that it’s kind of like citation in academia; except again, citations are tracked whereas use of my CC-BY work (unless it’s a publication) is not. So really, it’s just a sense that other people know I created something. Why should I care about this? Add to this the point that much of my work is not, perhaps, really “mine” in a deep sense because it is a culmination of so many other influences, work by so many other people that I have read or otherwise interacted with, and the question becomes even more pressing. Okay, maybe it will come back to me at some point; maybe I’ll discover my work being used somewhere with my name, and then I can realize some of the good things noted previously. But maybe not (and perhaps most likely not). Or perhaps someone will find something with my name on it and decide to connect with me–thus leading to a connection through effort on someone else’s part rather than mine. These things might happen, but is that enough to require attribution for my work? I’m not yet sure. I don’t have an answer, and you can’t answer for me of course, but maybe you have some ideas on why asking others to attribute one’s work might be a good idea, rather than just letting it go free into the wild. I’m thinking not so much for people who have to rely on their work to make a living, to make money off of it, but for people like me who are getting a salary from a university and could just share their blog writings, their photos, their OERs for free and without restrictions. 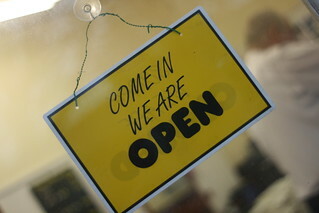 Posted in etmooc, Open Access, open ed, OER and tagged #h817open, creative commons on March 21, 2013 by Christina Hendricks.